Beijing and London agreed on Monday to continue jointly safeguarding multilateralism and global free trade as well as the World Trade Organization rules during the 9th China-UK Strategic Dialogue in the Chinese capital. The dialogue was co-chaired by State Councilor and Foreign Minister Wang Yi and UK Foreign Secretary Jeremy Hunt. Trade liberalization is widely accepted by the international community and is an irresistible trend, and China has always stood on the right side to uphold the free trade system, Wang said when jointly meeting the media with Hunt. "Whoever takes the unilateral approach will be isolated, which was, is and will be proved by international practice," he said. Wang said the two countries should resist any form of unilateralism or protectionism. The two countries agreed to enhance strategic communication and coordination in global and regional affairs, Wang said, adding that they will promote political settlement of troublesome issues and improve reform of the global governance system. China and the UK agreed to align their development strategies and expand trade and mutual investment, Wang said, adding that they will focus on promoting cooperation in nuclear power, finance and innovation, and expand cooperation in new industries like artificial intelligence, green energy and the digital economy. It is Hunt's first visit to China as well as his first trip outside Europe since he was appointed foreign secretary earlier this month. The development and growth of China present opportunities rather than a threat to the world, Hunt said. 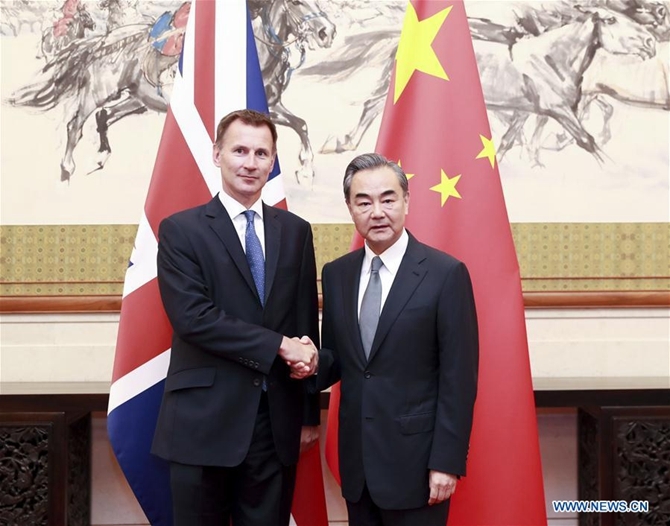 He said that the UK hopes to strengthen strategic dialogue with China, deepen understanding and friendship, and enhance exchanges and cooperation in various fields to promote the sustainable development of the golden era of bilateral relations. Referring to trade friction with the United States, Wang said Beijing's door of dialogue and negotiation remains open, and talks should be conducted on the basis of mutual equality and respect. "We have to take countermeasures when facing the US's aggressive attitude and infringement, and it is a legitimate defense," he said.